Hello everyone in the summary of blogging activity in September! 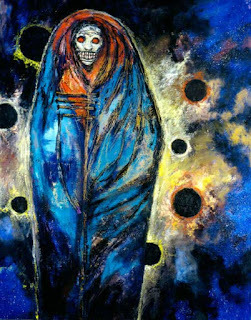 In the monthly introduction the art, today a return to macabre paint by Clive Barker's " The Sarcophagus" (aka 'Mother Theresa In Space', 'Guardian of The Nephauree' ). Clive Barker (b. October 5, 1952 in Liverpool) - English painter, illustrator, writer of horror and dark fantasy. The beginning of the month I greeted two weeks leave, whichspentheavily on mountain hiking. It allowed me totake a break from your busy daily life and filled energy to continue painting and blogging. Witam wszystkich w podsumowaniu blogowej aktywności we wrześniu! W comiesięcznym wstępie ze sztuką, dziś powrót do twórczości Cliva Barkera w postaci obrazu "The Sarcophagus" (aka 'Mother Theresa In Space', 'Guardian of The Nephauree' ). Children's dreams come true. Throughout these 90 years, watching old White Dwarf, I admired this figure. 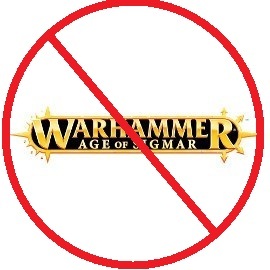 As soon as the appeared, whether on the occasion of the award-winning models of the next edition of the Golden Daemon, or battle reports with the participation of the Empire. 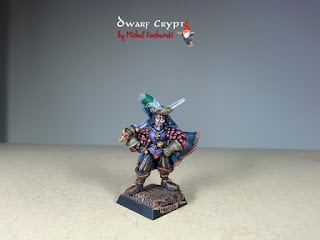 He has something (like the High Elf Ranger, also dedicated to the Warhammer Quest, and several other old figures) that convinced me to buyand paint. I also thought about whether it will be just a single model, the nucleus of something more. As I have already several groups of adventurers, more or less human, I decided for my own satisfaction and pure fun start collecting Witch Hunters band. 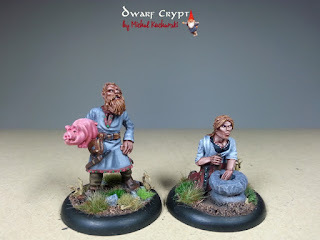 Of course, it will be a slow process, and the entries for the following members of the group will appear from time to time (unlike the Dwarf treasure hunters who will be painted fairly quickly - although I'm working on the next and last Trollslayer). 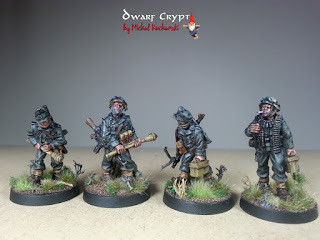 TodayI invite youto watchthe next twoGerman soldiersfrom theInbox of Volksgrenadiers. Paintingthemwas trying todo thebestI canat the moment,with an emphasis onthe dramapaintedon the faces ofGerman soldiersat the end ofthe war. 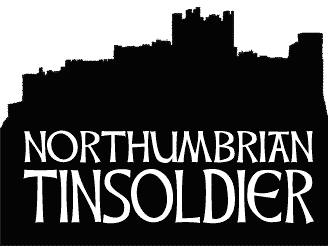 Volksgrenadiers Divisionshave beennamed inan attempt torebuildmoraleand raisethe fighting spiritof thenewly createdformation. These newsoldiersaged17-19years,the most frequentlydescendedmainly fromnavaland ground handlingLuftwaffe. At the beginning oftheirorganizationwas likethe Wehrmacht, inthe finalphase of the war,in some cases,comeunder the commandof the Waffen-SS. Volksrenadier Divisions have been named inan attempt to rebuild morale and raise the fighting spirit of the newly createdformation. These new soldiers aged 17-19 were recruited mainly from the navy and ground handling Luftwaffe. 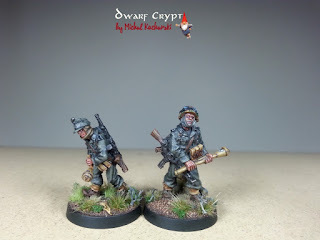 They were led by the officers recommended by theWaffenSS. Today I invite all honorablevisitors to the announced on FB profileentryabout theSlavs. 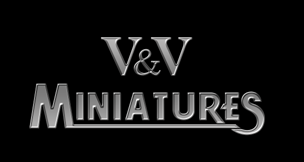 It will be apair ofSlavicinhabitants of rural areas of West Wind miniatures. Figurines I liked right away as a kind ofsupplement to the fields ofbattles and skirmishes, as well as the enrichment ofthe collection. I have a fellow Slav - lumberjack?host?and the lady working on Quern-stones-device for manual grinding grain. My Slavs tried to paint in folk climate (although it is a looseinterpretation), and so to fit into different periods. With success you can use them for a period of "dark ages" later Middle Ages, seventeenth century and in areas II war ending Ukraine. The following comparison of the Slavs from various figures of the era. Dziś zapraszam wszystkich szacownych Odwiedzających do zapowiadanego na profilu na FB wpisu na temat Słowian.